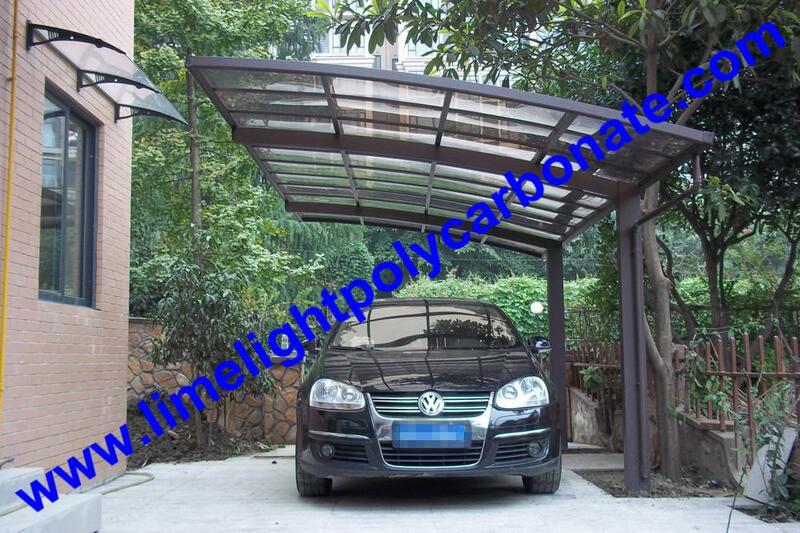 The carport is assembled with aluminum alloy frame and polycarbonate solid sheet, which offer a light weight and durable structure shade to protect your car(s) from sun, rain, snow, hail, etc. 1). Structure: Aluminum alloy frame is processed with electrostatic powder coating technology, which offer light weight, durable structure and strong corrosion-resistance surface. 2). 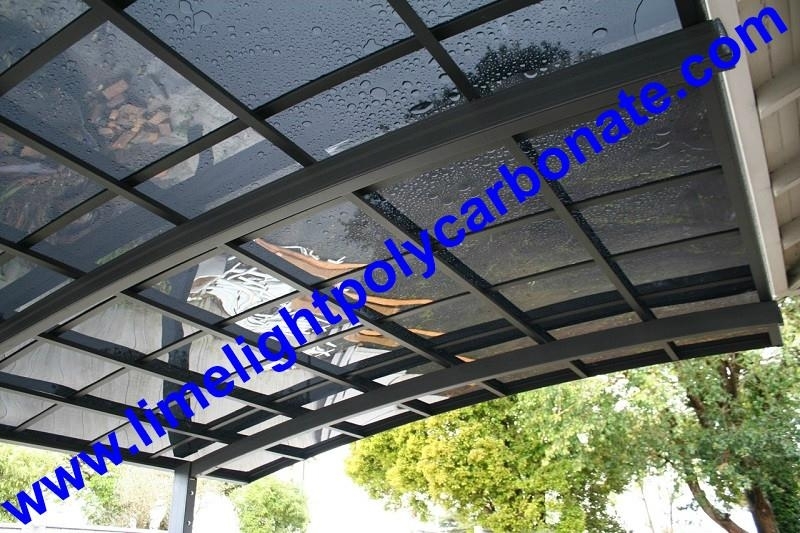 Roofing/Shading Material: Polycarbonate solid sheet is made of 100% virgin materials from Bayer and Lexan, with one side 50 micron UV layer, prevent 99.9% harmful UV. 4). Customer size: Can be ordered. 6). 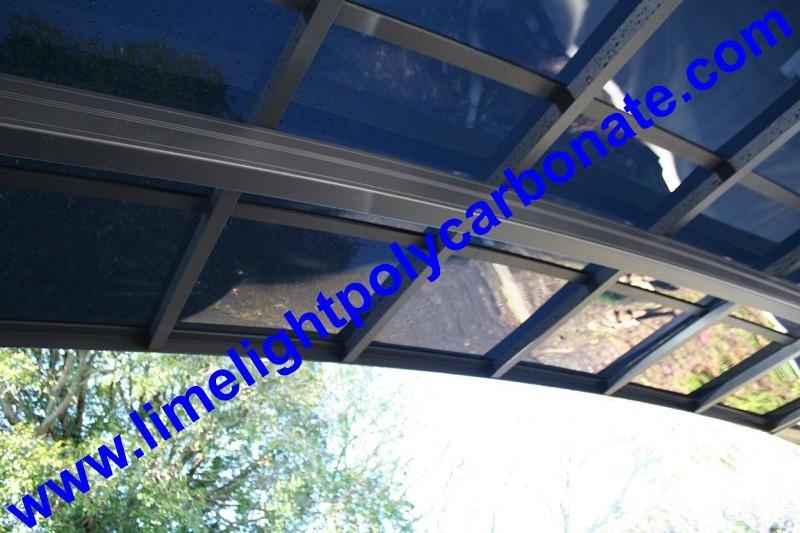 Polycarbonate solid sheet color: Clear, Bronze, Grey, Blue, etc. (Special color can be customized). 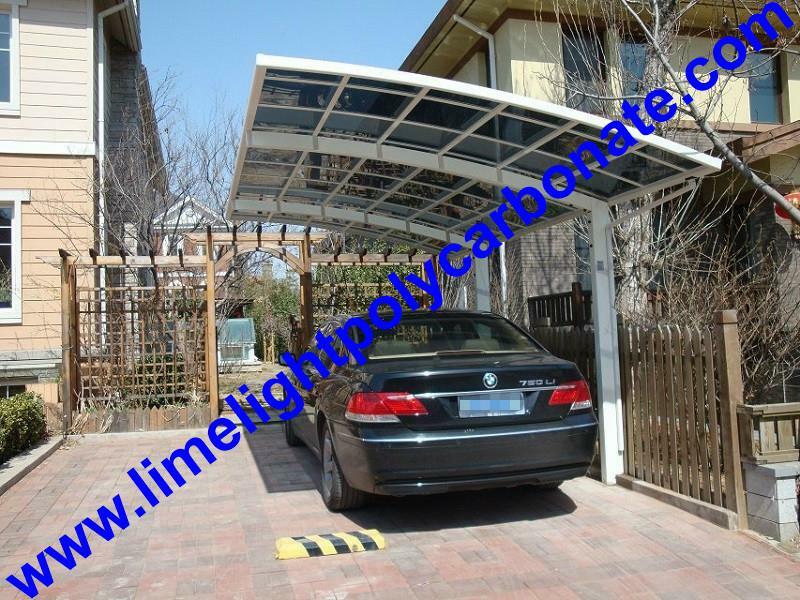 *Easy Installation: Polycarbonate carport accessories includes aluminum alloy frames, polycarbonate solid sheets and related accessories, they are light weight, you can finish installation by yourself under the instruction. 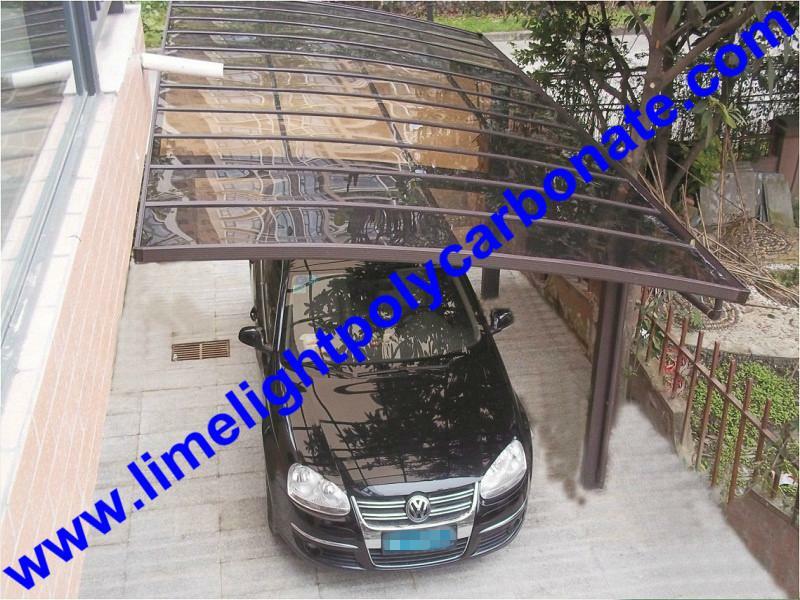 *Elegant design: Polycarbonate carport has single structure and slight curve which provides a modern, contemporary look and produces a carport of incredible strength and durability. *Resistance to Cat-12 Typhoon: Outdoor weather is extreme changes, from high speed winds to rain and hail. 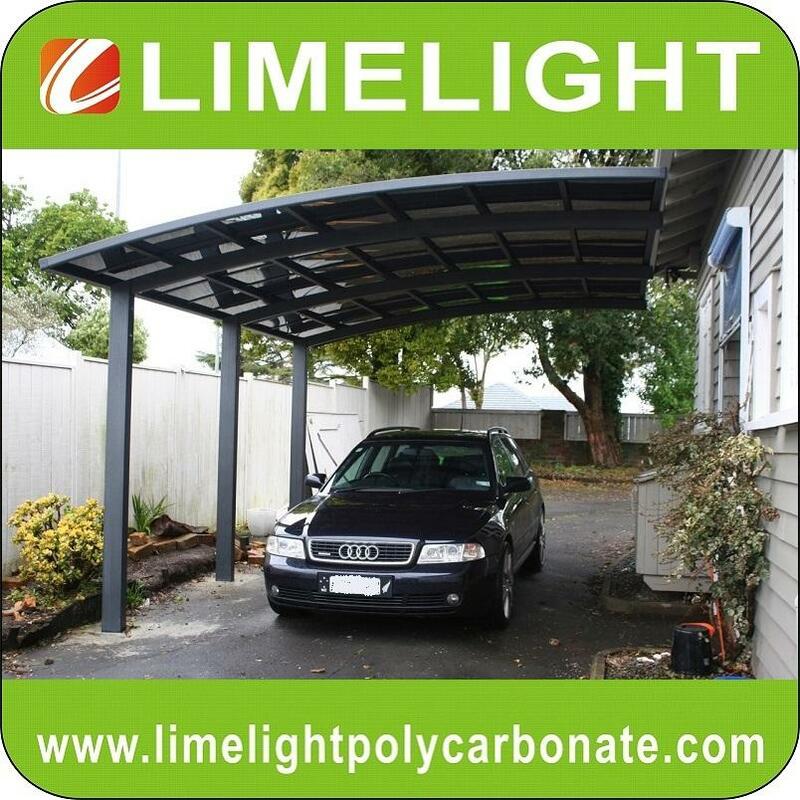 To ensure your car is well protected, Limelight carports are thoroughly tested and assured to the most extreme weather conditions possible. 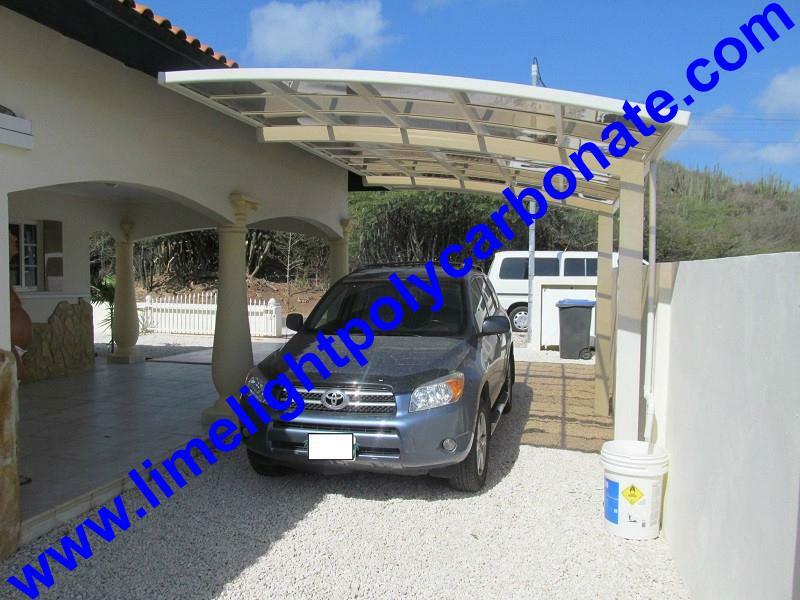 Rest assured that whatever the weather, Limelight carport is strongly built. *Ageing Resistance, prevent 99% UV: Everyone knows what damage can be caused by prolonged exposure to the sun. 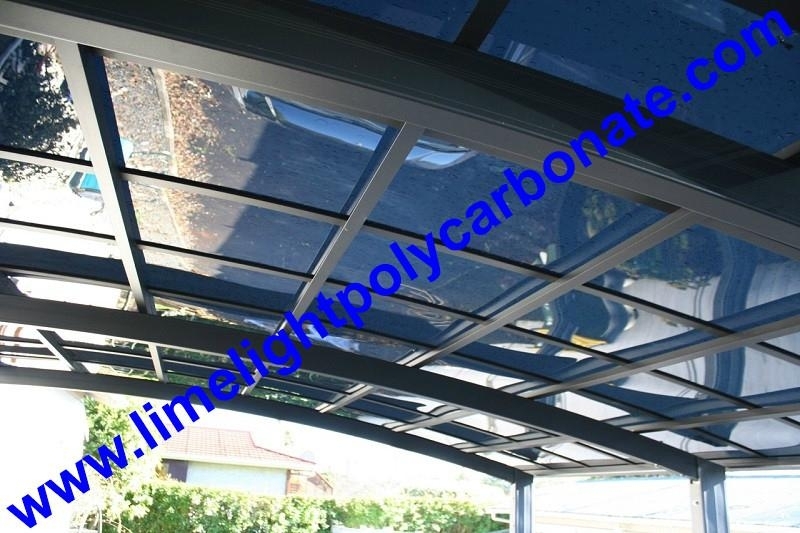 Limelight carport roofing material is made of polycarbonate solid sheet, with one side 50 micron anti-UV layer, the sheet can prevent 99% of the sun’s harmful UV rays, protect your car fadeless during this condition. Also, the anti-UV layer can prevent the sheet ageing and postpone the carport life span and outstanding looking. 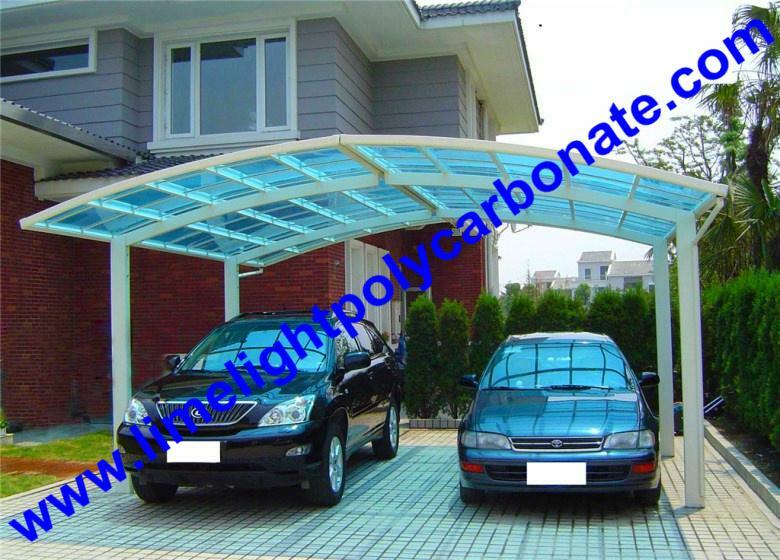 *Heat insulation & Sound-proof: Polycarbonate solid sheet has good heat insulation, it lets in light and keep out heat. Also, it has superb effect of sound-proof, 28 decibel decrease for 3mm solid polycarbonate sheet. 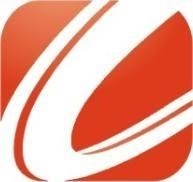 *Impact resistance: 250~300 times that of same thickness glass, 30 times that of acrylic sheeting. 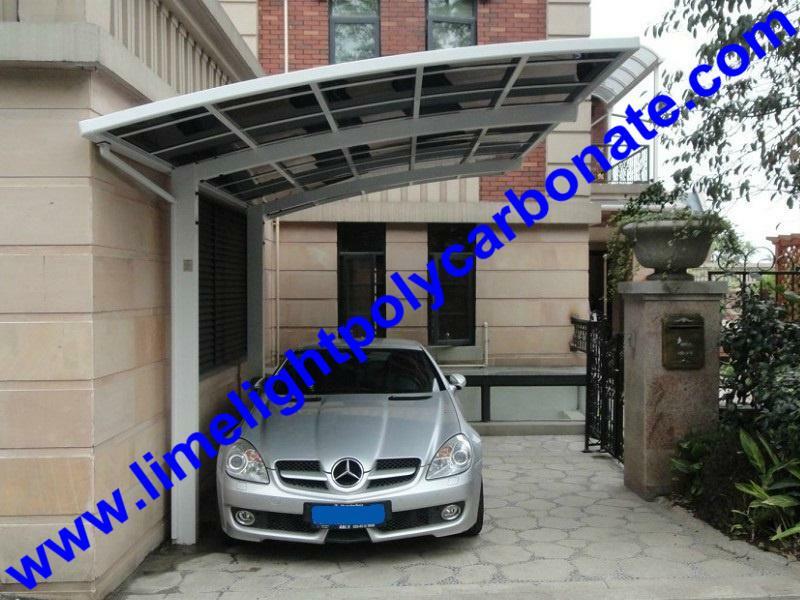 *Flame & chemical resistance: Limelight carports are specially coated with a unique formula to protect them from abrasive cleaning chemical and damaging elements of heat and fire, high flame performance rating is class B1. 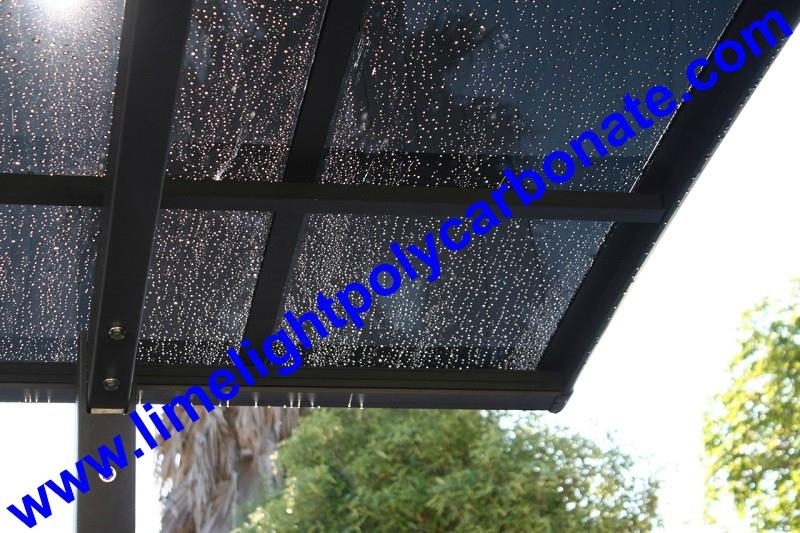 *Self-clean by rain water & low maintenance: The rain water can clean the dust on the sheet surface, it save your cost to maintain your lovely carports. 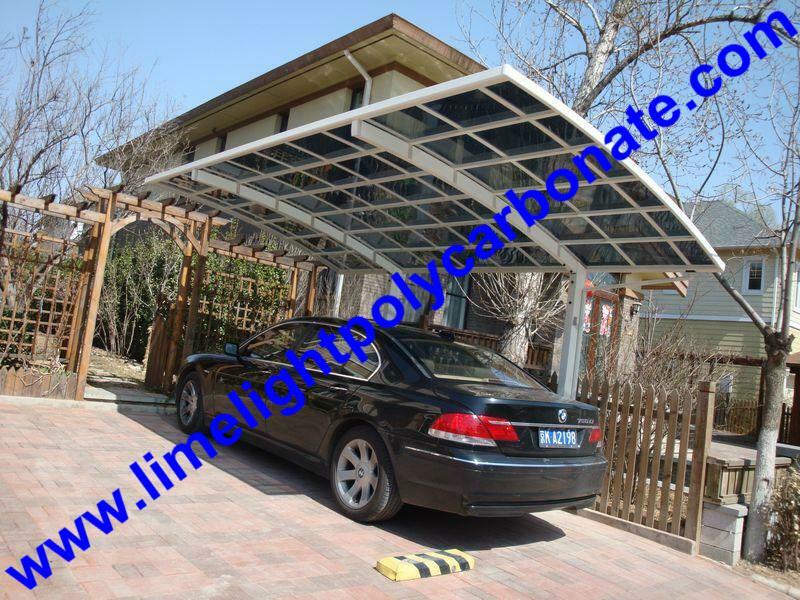 *Quality warranty: The carport frames and sheets are strong and durable, we offer 25 years warranty for aluminum alloy frame and 10 years warranty for polycarbonate solid sheets. 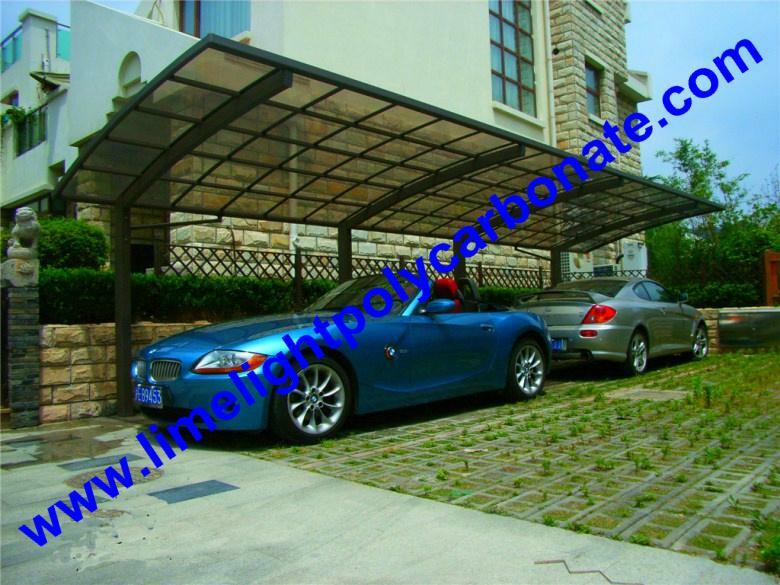 Application: Private and commercial carport, Car canopy, car awning, etc. 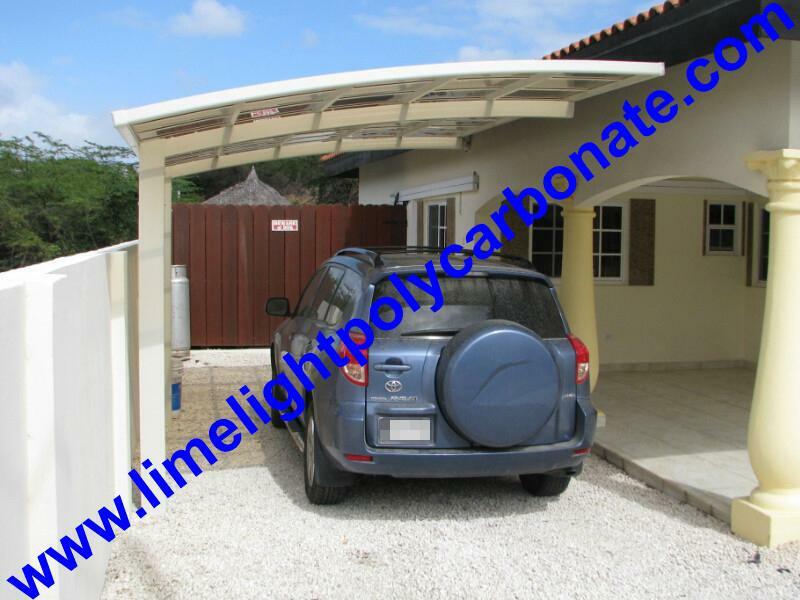 Please contact us for more details of carport(s), thanks.